Plastic Easter eggs threaten to take over my house every Easter. Sure these eggs are fun to fill and hide. However, once the kids empty their goodies from the plastic eggs, they become a nuisance. They end up on the floor, under couches, in toy bins, EVERYWHERE! Even when I put them away, I still find myself stepping on miscellaneous plastic Easter eggs in July. I am a huge fan of recycling and upcycling, so I started thinking about different ways I could use plastic Easter eggs. Today I want to share a plastic Easter egg feelings memory game I came up with for the kids. Even if you don’t have plastic Easter eggs on hand, they are so inexpensive and you can find them almost anywhere. I bought my plastic eggs from Wal-Mart. However,you can find them at the Dollar Tree and other dollar stores for cheaper. I happen to spend a ridiculous amount of time at Wal-Mart and Michael’s so that’s usually where all my money is spent! The plastic Easter egg memory game is played just like the classic game Memory. 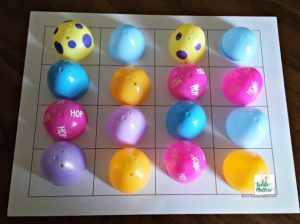 To set up the game, you will need to download the free printable Plastic Easter Eggs Feelings Memory Game game board. You will also need eight medium to large size plastic Easter eggs. You want the eggs to be big enough to completely cover the emoji feelings faces on the game board. 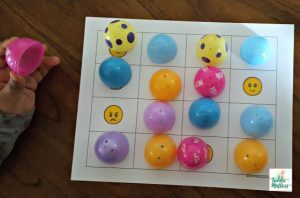 Once you’ve printed out your game board and gathered your plastic Easter eggs, open up the plastic eggs into halves. 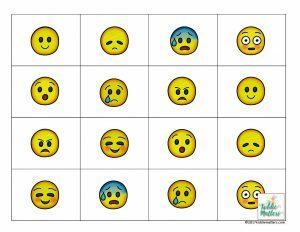 Next, place the halves over each emoji feeling face. Kids will then take turns flipping over the plastic Easter egg halves to try and find pairs of emoji feeling faces. If they find a match, they get to put the egg back together and keep it. If playing with more than one player, the player with the most egg halves at the end of the game wins. My kids also did a timed version where they competed to see who could find all the matches first. The possibilities are endless! Kids will like this plastic Easter egg feelings memory game because it’s fun. 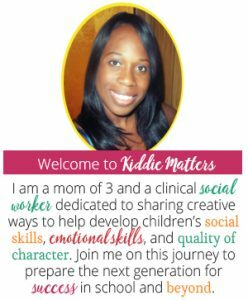 I like it because while the kids are playing, they are learning to look at different facial expressions and characteristics to figure out how someone is feeling. This is an important skill for kids to have in order to develop empathy for others. Now here’s the bonus. This activity also help kids work on their concentration and memory skills! 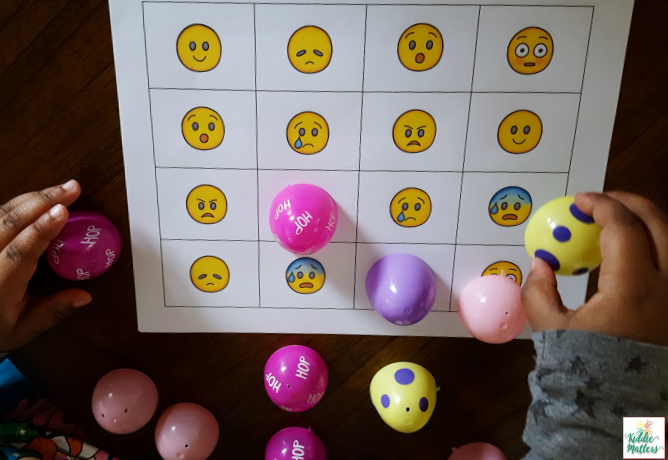 For instance, while playing this plastic Easter egg feelings memory game, kids learn to pay attention to details so that they can remember where they can find specific emoji feeling faces on the game board. I hope you enjoy this activity and put those leftover plastic Easter eggs to good use. Don’t forget to download and print the free Plastic Easter Egg Feelings Memory Game board! Thanks Elizabeth! That means a lot!